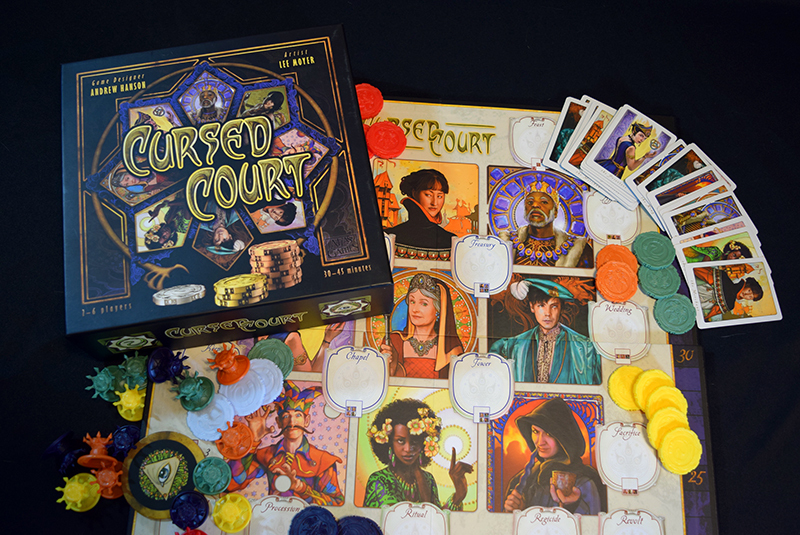 Cursed Court is a uniquely attractive game of wagering,bluffing, and deduction. 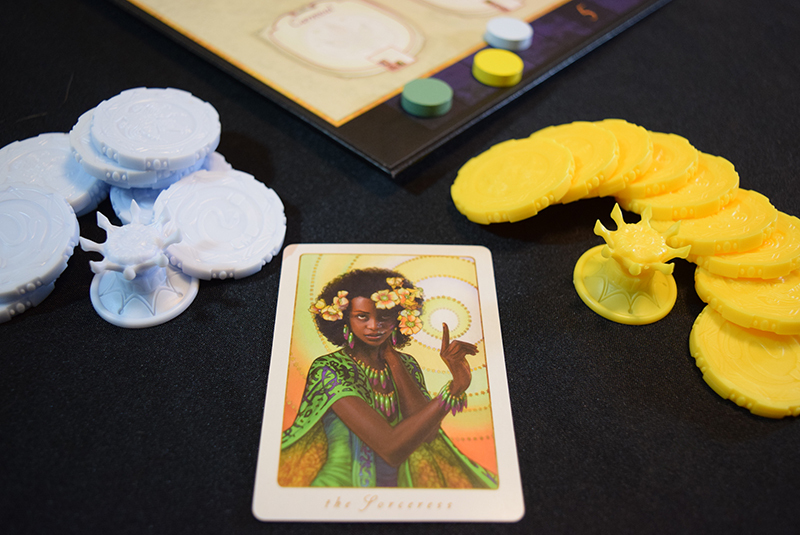 While it's gameplay is quite abstract and uncomplicated, this beautifully presented game delivers a tight experience in subtle bluffing and betting, and sitting at its sweet spot at around 3-5 players. 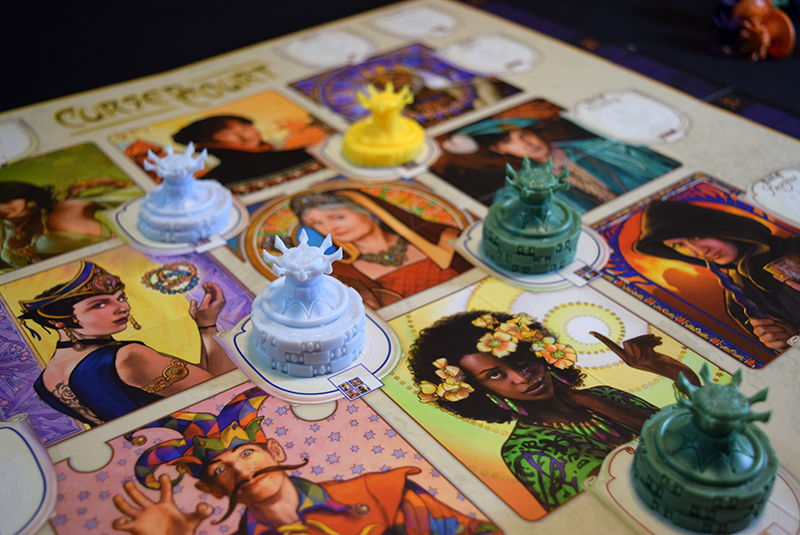 In Cursed Court, players will take on the roles of minor nobles in the titular court, all vying to increase their influence by trying to predict which of the greater nobles will come into power during the year. But all that, much like Cursed Court’s aesthetic, are pretty set dressing for what is really an abstract deduction and betting game of limited resources and best bets. Gameplay in Cursed Court takes place over a series of 3 rounds, called years, and each year is played over the course (you guessed it) 4 seasons, with each player taking a turn per season. 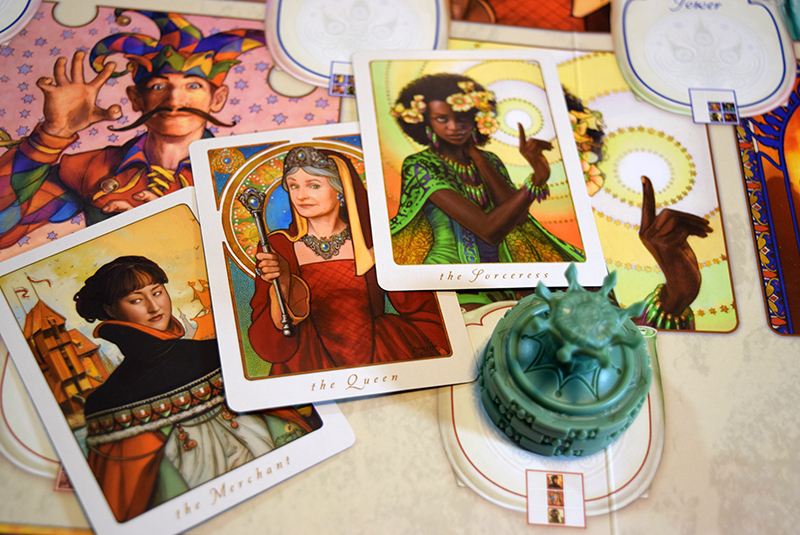 On your turn, you will use one of your crowns to wager on either a specific noble or set of nobles which you believe will have influence over the court at the end of the year. Wagers are placed by adding your crown, along with a pile of coins, to the space on the board that indicates which noble(s) you’re backing. Andrew: Now, the logic behind where you might wager is based on what makes Cursed Court such a fun, thinky game. 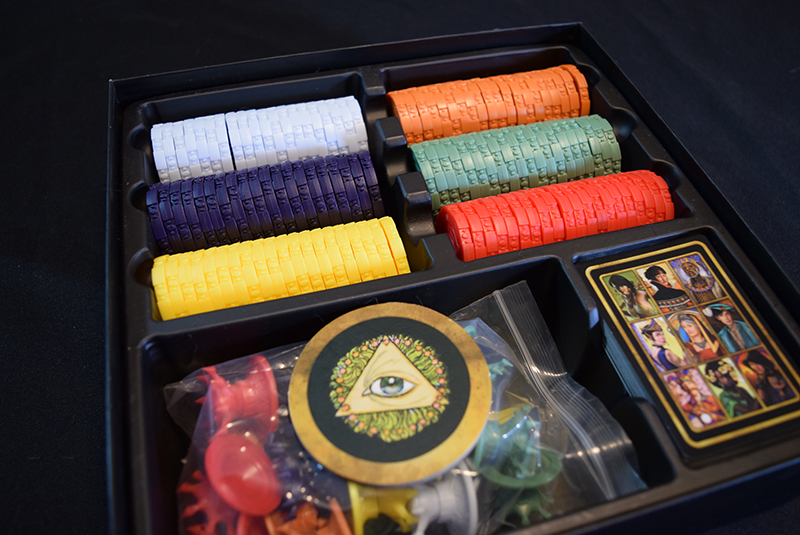 Each season, before wagers are made, players will receive some information on what nobles are rising to prominence in the court – a series of face-up noble cards will be dealt to the table, signalling this shift in power. 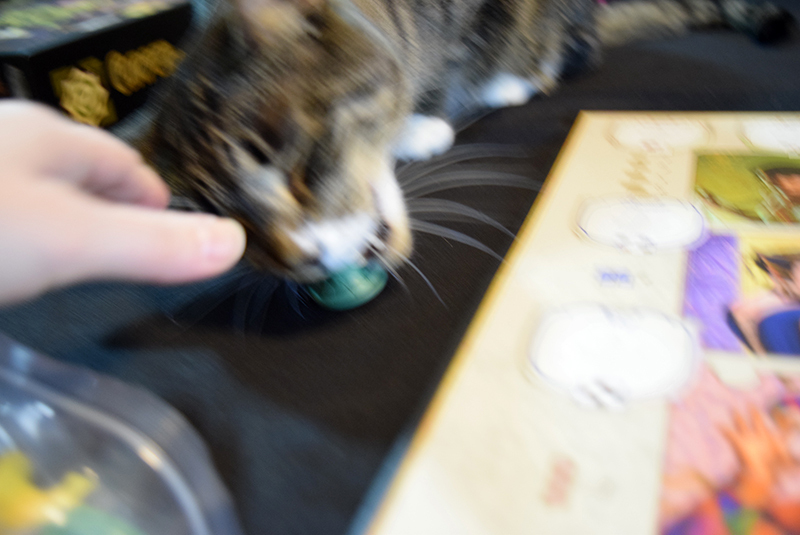 However, each player also gets some further insight, in the form of face down cards played at the beginning of each year. These cards are placed between players, and only those players on either side of these cards can look at them. When placing wagers, you will need to decide how many coins to commit to that bet. If the wagering region is empty, you can place as many coins as you like. However, if there’s already a player wagering at that location, then you need to at least double their current wager in order to bump them. You can commit more than double, but that’s your minimum in order to displace someone. 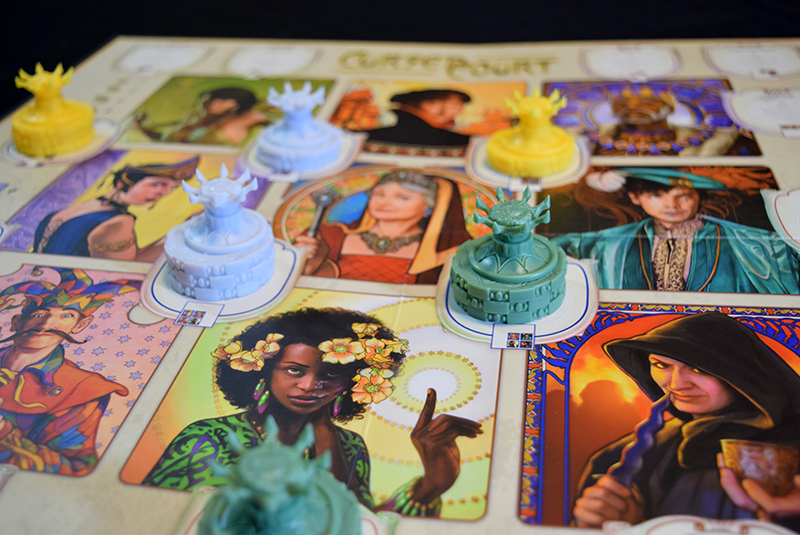 Jess: The production in Cursed Court is fantastic – the art is gorgeous, the coins are nice and chunky, and the board makes it really easy to see where everyone’s wagering at a glance, which is really important. Coins are limited, and canny placement is really important to your overall strategy – your coins stay committed to where you place them unless another player bumps you. So if you end up betting on the wrong space, then those coins will likely stay stuck there for the round, which means you’ve got less ability to bump other players, or to resist getting bumped yourself. Scoring is done at the end of each of the three years – all private cards are revealed, and the value of each player’s wager is assessed. Each noble is worth a number of points based on the number of copies of the noble cards that correlate to the space, and each set space is valued based on whether it’s a 3 or 4 card set. Jess: It’s important to remember that your coins ultimately don’t correlate to points at all – they’re just there to help you establish control over wagers. You’ll get all of them back between years! After the scoring at the end of the 3rd year, the player who has the most points is the winner! Andrew: So, what did we think of Cursed Court? Jess: I actually quite liked it. 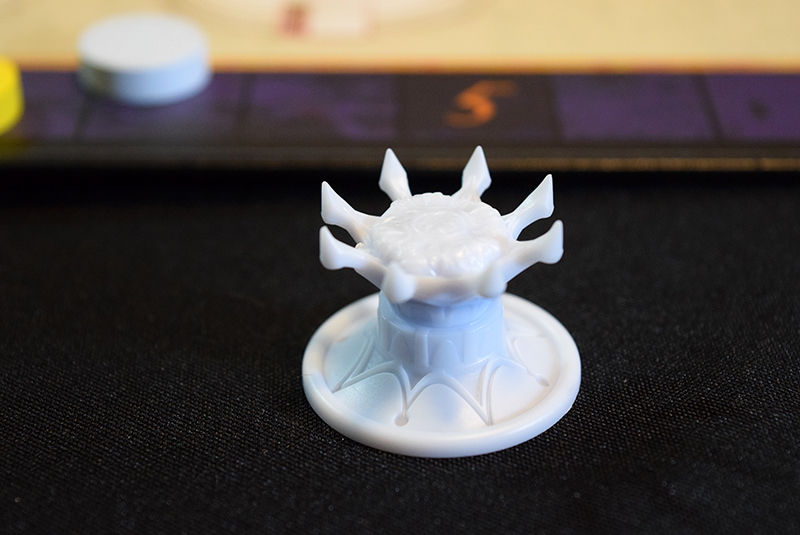 It’s a simple game – the placement rules can be summarized in, like, a sentence, and while it’s a bit of a deduction game, it’s got just enough strategy to be interesting without being brain-burning. Crowns are incredibly sharp, for some reason. Andrew: I agree. I liked this one – for me, the interest came from how everyone has slightly different information. It was cool watching what other players were doing with their coins and trying to bluff them with mine – nothing’s more satisfying than intentionally making a bad wager, only to get bumped by someone who thinks you’re onto something and inadvertently stranding their coins. Jess: Yeah, but because of the hidden cards and the fact that cards continue to come out over the course of the game, you don’t ever have perfect information – that bet you might have manipulated someone into making can always turn out to be a profitable one, and I really liked that! Andrew: Same (though I did feel salty when it backfired on me). My one observation here is that, while it technically plays 2, it’s definitely more fun with more – I think 4 or 5 is probably the sweet spot, because then you’ve got lots of spread on what info everyone has and good competition over wagers, which is what makes Cursed Court fun! The greatest threat to your kingdom by far. All in all, we enjoyed Cursed Court. It’s not a deep or complex game by any stretch, but what we have here is a beautiful, well-produced introduction to the core mechanics that make this sort of game work, especially at higher player counts which lend the game the sort of cut-throat competition that makes it hum. Those looking for deep, pensive strategy should go elsewhere, but with little deduction here and some bluffing there, Cursed Court’s got the makings of a perfectly good time!